I am a sociologist, specialising in the sociology of the family with a Masters degree in Applied Social Research and a PhD from Trinity College Dublin. I am currently working on a project on Intergenerational Relationships in South Africa: A study of family responsibilities and obligations. I recently authored a book on Divorce, Families and Emotion Work and I co-authored a book in 2015 on customary marriage, divorce and intestate succession. My work has appeared in The Journal of Family Issues; Gender & Society; Families, Relationships and Societies and The Journal of Southern African Studies. My principal research interests lie in the field of personal life, kinship, gender, intergenerational relations, customary law, family law and policy, feminist theories, biographical methods and mixed methods. I am also the Director of the Families and Societies Research Unit (FaSRU) at the Centre for Social Science Research. FaSRU is a new research unit that examines households, families and kinship from an inter-disciplinary perspective. It currently includes ten postgraduate students researching aspects of family life. 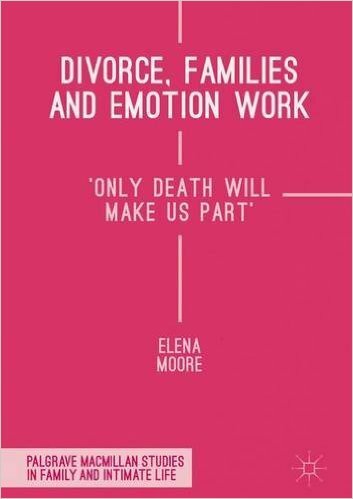 Moore, E (2016) Divorce, Families and Emotion Work: 'Only Death Will Make Us Part'. London: Palgrave Macmillan. 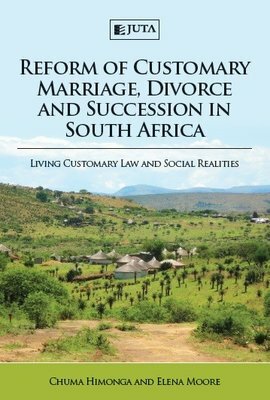 Himonga, C and Moore, E (2015) South African Reform of Customary Marriage, Divorce and Intestate Succession: Living Customary Law and Social Realities. Cape Town. Juta. Read the Summarised Research Report here. Moore, E. & Himonga, C (2017) Centring the intersection of race, class, and gender when a customary marriage ends: An intersectional critique of the Recognition of Customary Marriages Act of 1998. Moore, E (2016) Delaying Divorce: Pitfalls of Restrictive Divorce Requirements. Journal of Family Vol. 37(16) 2265–2293. Moore, E. (2015) Forms of Femininity at the End of a Customary Marriage. Gender & Society. 29 (6) 817-840. Moore, E. (2012) From traditional to companionate marriages: women's changing experience of marriage and divorce in Ireland. Famlies, Relationships and Societies 1(3):345-360. I am primarily interested in supervising research that is focussed on social change in personal life, inequalities in family life and the relationship between families and the state. This could include research on intergenerational relationships, family or child policy, customary marriage, divorce, division of labour and resources in households, transnational families, lone motherhood etc. I will supervise projects in any aspect of personal life, intimacy, gender and generational relationships, family, sexual relationships, and/or social change. I am trying to develop more work on ‘intergenerational relationships’ in South African families, in particular, I am interested in supervising anything which investigates the importance of intergenerational relationships and how they link the lives and trajectories of different generations. I am also very interested in supervising socio-legal work on marriage, divorce and succession.